Stalking Horse Press, 9780998433967, 202pp. It's 1973, and a thirty-something widow has been cajoled by a young hippie parasite into financing their vacation to a nudist colony in the Northern California mountains. The night before their departure, however, she arrives home to learn that she and this man will be accompanied by the stripper on his lap. At Camp Freedom Lake, the trio meet a womanizing evangelist, a bumbling Zen gardener, and a pair of aging drug-addled swingers from Holland. Together, they're catapulted through one improbable event after the other, each stranger than the last, until finally the woman who was dominated by her fear of past and future finds herself reveling in the great here and now. 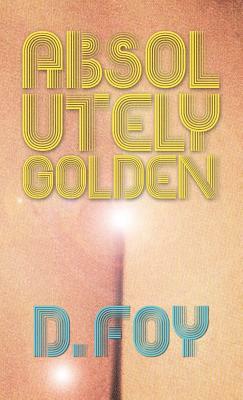 D. Foy's Absolutely Golden is a radical departure from his two previous novels, Made to Break and Patricide. It's comic, ebullient, magic, light, gently surrealistic. It's rollicking, effervescent, slyly profound. But more, this brisk tale offers a kaleidoscopic look at parts of the 1970s we haven't often seen in fiction--nudism, New Age philosophy, Eastern religion, the occult, swingers culture, California culture, and then some. Best of all, Foy tells his story in the guise of a woman obsessed with the notion that she'll never find another man until she's rid of what she believes to be a mysterious curse. As if written in the marriage of Vladimir Nabokov, Renata Adler, and Ana's Nin, her words transport us from doubt, despair, and dread into states of increasing wonder and euphoria.